Sir Thomas Smith obtained the property of Hill Hall in Essex in July of 1554 through his marriage to Philippa Wilford, but it took three to four years before he actually made it his primary residence. He did not receive the official reversion until 1556, after which extensive renovations had to be finished before his wife and their servants would be comfortable in their new home, a process which, according to his diary, took two years (1557-58). The trip from one house to the other lay directly through London, with Ankerwycke several miles to the southwest and Hill Hall about the same to the northeast. As the crow flies it’s about 40 miles. 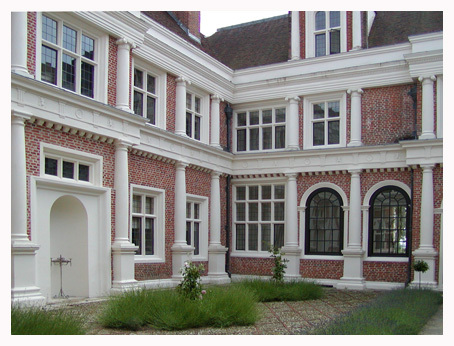 What records there are suggest that from 1557 or so he kept staff at Hill Hall, but that, even after the move to Essex, he continued to maintain a household at Ankerwycke, both probably staffed by local people who had ties to their respective communities. So it’s hard to say exactly where de Vere might have been at any given time between 1559 and 1562. Perhaps he too shuttled back and forth from Windsor to Essex during the final three or four years of his life with Smith. In any case, what seems most likely is that it was to the newly rebuilt Hill Hall that he came to rejoin the Smith household following his departure from Cambridge in March or April 1559. That he did live there is confirmed not only by Smith’s letter to Burghley, but also by the memories of today’s Hill Hall neighbors, passed down through the centuries. Following the coronation of Elizabeth and her first Parliament, Smith returned to Essex charged with various local duties, among them assisting de Vere’s father, the 16th Earl of Oxford and Lord Lieutenant of Essex, in swearing in the local JPs. Concerned that the accession of the Protestant Queen would be a signal to the Spanish that it was time to attack, Smith and his counterparts in all the shires were also to see to it that the constables carried out the necessary musters of “the most likely and able men for the wars” and that these accounts, along with notes on the state of their arms and other equipment, were provided in due course to the Lords Lieutenant (a situation that conjures up Falstaff’s hilarious review of the militia in the third act of Henry the Fourth Part Two). With the death of Mary and the coronation of Elizabeth the world may have opened up for Edward’s caregivers, but for the boy himself it could have felt like a change for the worse. Trouble may could have been brewing between Sir Thomas and his wife, trouble that later would explode into open warfare during Smith’s final illness. Smith was probably away from home more than before, having duties to attend to throughout Essex and Suffolk. In his late forties, still without a job at Court and with the birth of an heir less likely every day, his patience, never very profound and now stressed by an increasing fear that the world was passing him by, must have been wearing thin. That he was furious with Cecil is evident from hints in the record, though there’s no sign of exactly what the trouble was. 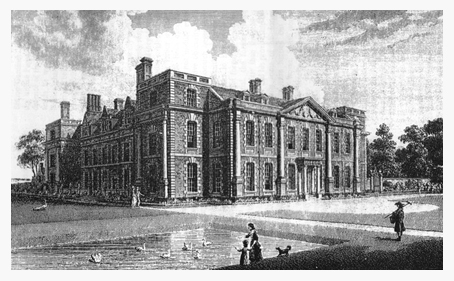 At Hill Hall, Philippa was finally mistress of a property that she may have felt, understandably, was more hers than it was Smith’s, as it had been left to her by her first husband, Sir John Hampden (“of the Hill”), an opinion it’s evident Smith didn’t share as he plunged into involved and idiosyncratic plans for it’s renovation. At ten and eleven, Edward was getting old enough to be having some attitudes of his own. The five months alone at Cambridge must have made it clear that life was vulnerable to sudden changes. After having tasted university life, he may have been eager to belong to a world surrounded by boys and men, by constant activity and challenge. He may have felt he had gotten all he could from Smith, while Smith may have felt that after six years of personal tutoring, his charge had learned just about all he had to teach. Both tutor and student were probably ready for a change. With so many of the sites gone that knew de Vere, it’s a pleasure to be able to visit Hill Hall, now located a short cab ride from the Epping stop on the underground Central line from London. Acquired in 1998 by the English Heritage Society and beautifully renovated, its location atop a windy hill looks out over a landscape much the same as in Smith’s day. 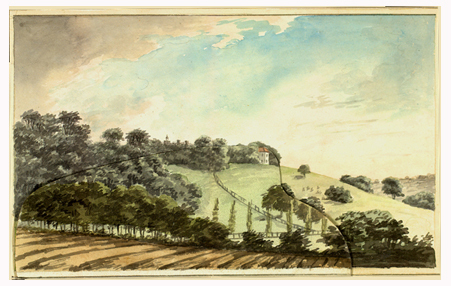 Watercolor by Humphrey Repton in 1658 to show how he would redesign the surroundings. Though more heavily wooded then, standing outside and looking from one direction to another, one sees essentially the same view that de Vere would have seen, the gently rolling hills of south central Essex, with the local parish church, St. Michael’s, rebuilt by Smith, still within walking distance. The property included two residences, the larger, Hill Hall, Smith completely rebuilt. The smaller was rented for awhile to a local farmer and apparently it too was rebuilt at some point. Smith’s house has aroused a good deal of interest in recent years for it’s innovative design, based on studies he made of buildings while in France and the many books on architecture in his library. Smith must have been greatly relieved to be able to return to his home county, and to such a prominent setting, high on a hill where the air was always moving and fresh. He complained that at Ankerwycke, which was “low” and “waterish,”he suffered continually from “agues” and “rheums.” Here, surrounded by the estates of other members of the Court community, he would work to create a permanent home base, for himself and for his posterity. Despite the fact that he had residences near Windsor and in Westminster, Hill Hall––or Theydon Mount, as he preferred to call it––would remain his true home for 20 years. There’s evidence that Smith’s first effort to rebuild Hill Hall failed at some point. Building with bricks manufactured onsite, he was apparently unaware that Essex clay lacked the lime that’s necessary to bind the clay to the straw when fired, so that after some time the bricks began to crumble, and Smith had to start over, apparently following his return from France in 1566. In fact, it may be that his library inventory of 1566 was made because he needed to have his books stored somewhere while he rebuilt that part of the house. Nothing is said of this problem in his letters home, but it’s unlikely that all his letters have been saved. However and whenever the building came about, as always he planted orchards, gardens for herbs, flowers, and vegetables, ponds for fish, and an alley of trees leading to the house from the road. 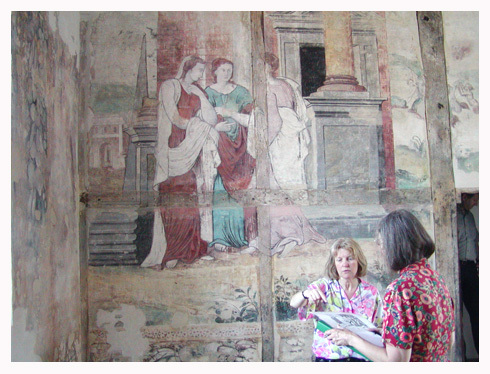 The unusual frescoes that decorate the interior of his study, one of Psyche from Greek mythology, the other of Hezekiah from the Bible, recovered during renovation, were painted well after de Vere’s sojourn, but similar paintings may have decorated the walls of the first building. With the move to Essex, Edward would have had more opportunities to visit his family at Hedingham Castle, a single day’s ride to the north (on a good horse in good weather). With his father as Lord Lieutenant of the county, there would have been opportunities to travel back and forth with Smith, who held county office so had reason to consult with de Vere’s father. Summers in particular gave time for longer stays and an opportunity to get to know his parents, his mother’s relatives at Bloomsters, and his sister, Mary Vere. However isolated and displaced he may have felt at times at Cambridge and at Hill Hall, at Hedingham he was always welcomed with smiles and open arms. Here the bows and pleasantries due him as the future lord of Essex were genuine, based on his family’s long relationship with neighbors for miles around and his future role as their traditional lord. This must have been pleasant, but, considering how isolated he had been up to then, and with only the gruff Sir Thomas as a role model, at ten and eleven he may have been a bit awkward in his response. He would have been introduced on these visits to the family vault at Colne Priory just up the river, where generations of his ancestors lay atop their tombs in alabaster splendor, some with their wives, surrounded by the symbols of their offices and accomplishments. There must have been a good dozen until vandals destroyed the priory during Oxford’s lifetime, and most of the tombs broken and desecrated. 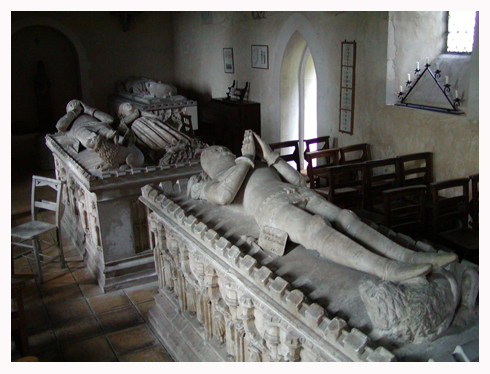 Of the original collection, five tombs are left, still preserved in a little country church not far from Hedingham. Though de Vere probably missed out on the Queen’s coronation when he was eight, at age 11 he would certainly have been included in the festivities surrounding her visit to Hedingham during her long summer “progress” of 1561. First came a play by his father’s aging protégé, the fire-breathing reformer John Bale, performed for the local grandees at a hall in Ipswich, probably by the Earl’s own company of players. In King Johan, the anti-papist Bale reconstituted the historically wicked John II as the one English king with the courage to defy the Pope. That the eventually-defeated king is defended at the end by a character named “Verity” suggests a courtesy gesture to Bale’s patron, John de Vere. Riding waves of enthusiasm and relief following the accession of the Protestant Elizabeth three-and-a-half years earlier, the 16th Earl went all out to entertain his glamorous new monarch with feasts that lasted half the day, and with dancing, music and interludes by the Earl’s own actors and musicians lasting on into the night. Just approaching her twenty-ninth birthday, slender, witty, imperious, dressed to kill, her pale skin and cloud of red hair proclaiming her true British origins, Elizabeth was every inch her “princely Majesty.” Edward may already have been introduced to her during Christmas festivities at Windsor or Greenwich, but here at Hedingham, on his own turf so to speak, he would have had more opportunity to connect with her, perhaps to converse at dinner. Always interested in the noble boys who would be joining her throng at Court, she would have pressed him for evidence of his studies and interests. Pleased with his progress, she probably saw no reason to have him removed from Smith’s care just yet. If so, it wouldn’t be the last time that the Fairie Queene put a damper on Edward de Vere’s ambitions.